The Bump (SD B) Series Machines are used to simulate and evaluate the design and destructive testing of components, circuits, hybrids, and complete assemblies as it pertains to bump. 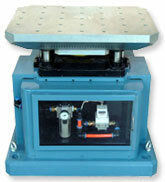 There are 7 standard bump machine test systems available or we can also customize one to meet your needs. All our bump machines are pneumatically powered shock testers for accurate/repeatable laboratory and production impact testing. With suitable pulse generators, these bump machines can produce half sine wave shapes which meet the specifications of military, industrial, and individual test requirements. Generated waveforms comply with typical military specifications, including ISO, MILSTD-810, and customized method. They are used for both the commercial field and military applications; testing a wide variety of products from disk drives to wristwatches, and spark plugs to automotive sensors. Excellent wave form for small g level bump testing: The min g level for bump testing can extend up to 2.0g. Traditional mechanical bump machines can extend up to 5.0g. DUT mounting table: The table is made from aircraft aluminum with high strength and uniformity but light weight. It is guided by 4 guide rods to keep high stability. High precision guide: Chromium plated high precision guide rod and sliding bearings assembly ensure the guide system a long life. Mounting Table Drive System: Adopting a high frequency velocity air cylinder with pilot actuated valve can ensure a short shock distance. This can result in the same shock terminal velocity, which is generated by 1.5 meters drop distance, a normal free drop shock machine. A precision displacement transducer, controlled by software, ensures the precise repeating drop height to get accurate repeatability of shock test. Auto Shock control: MIS02 is control and measurement system. Please refer respective spec sheets for further information. Expending features: Bump frequency and shock energy specifications can be expanded in a customized machine. The Shock and Bump (SD B) Series Machines are used to simulate and evaluate the design and destructive testing of components, circuits, hybrids, and complete assemblies. 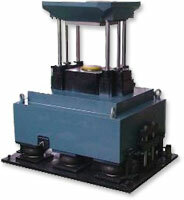 There are 5 standard shock and bump machine test systems available or we can also customize one to meet your needs. All our shock and bump machines are pneumatically powered shock testers for accurate/repeatable laboratory and production impact testing. With suitable pulse generators, these shock and bump machines can produce half sine, sawtooth, and square wave pulse shapes which meet the specifications of military, industrial, and individual test requirements. Generated waveforms comply with typical military specifications, including ISO, MILSTD-810, and customized method. They are used for both the commercial field and military applications; testing a wide variety of products from disk drives to wristwatches, and spark plugs to automotive sensors. Second shock preventing brake: After the first shock, the brake will be active to prevent an undesired second shock. Shock absorption base: Shock absorption base is configured with a two-way damping device and large air bags. This can reduce the shock force transferring to the floor. No dedicated seismic base needed. Waveform Generators: Waveform generators can produce half sine, trapezoid, and sawtooth waves. Auto Shock control: ASK01 uses touch screen to control the shock activity. 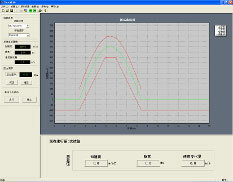 MIS02 is control and measurement system. Please refer respective spec sheets for further information.